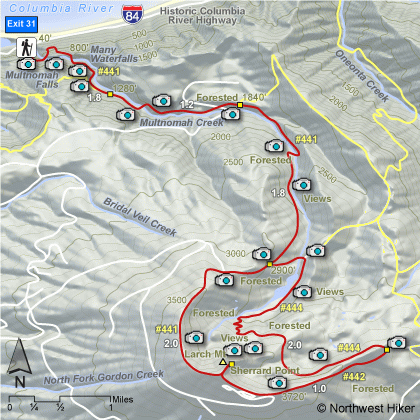 This challenging hike has lots of waterfalls, lots of elevation and lots of miles. Starting at the Multnomah Falls trail head, you hike up past the top of the falls, following Multnomah Creek for about four and a half miles to a junction that allows you to make an excellent loop hike out of this adventure. 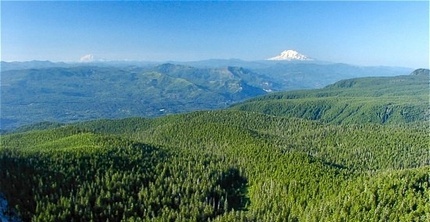 Follow Trail #444 for about 2.75 miles where it connects to Trail #424 and leads you to the top of Larch Mountain and Sherrard Point, where you enjoy the only real vistas during this long forested hike. From there follow Trail #441 back down the mountain to Multnomah Falls where you began. at the summit of Larch Mountain.